Heliconia is a genus of about 100 to 200 species of flowering plants native to the tropical Americas and the Pacific Ocean islands west to Indonesia. Common names for the genus include lobster-claws, wild plantains or false bird-of-paradise. The last term refers to their close similarity to the bird-of-paradise flowers (Strelitzia). Collectively, these plants are also simply referred to as heliconias. 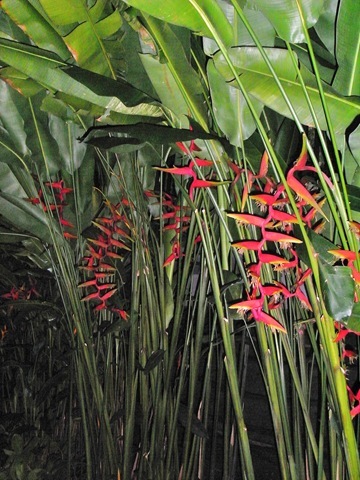 Heliconia rostrata is something that we, Singaporean are all too familiar with. It is one kind of very common road side flowers for our streetscape, as such, not many people want it to be planted in their gardens. But actually it can be planted in a big pot, with the flowers in red, yellow and a tinge of green facing downwards, this easy to take care kind of plant will sure light up any places. As long as there is enough sunlight and water, It would bloom from time to time and usually the blooms last for 3-4 weeks. The blooms look like firecrackers that we burn during Chinese New Year. The green leaves look more or less like banana leaves, it can be arranged by itself in a big glass vase for house decoration.